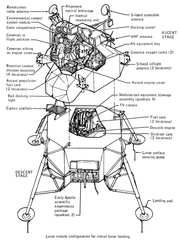 The Apollo Lunar Module (LM) is the spidery-looking landing vehicle on the moon. It was built for the US Apollo program to carry a crew of two from lunar orbit to the surface and back. 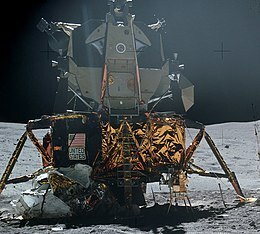 The LM was the last of the Apollo “hardware” to be developed. Its start had been delayed while NASA made up its mind to take the lunar-orbit meeting approach and thus require a vehicle like the LM for a landing. A contract with the prime builder was signed on January, 1963, almost two years after the Apollo project began. The LM was tested several times in space. Finally, on July 20, 1969 the Apollo 11 LM Eagle made the first manned lunar landing. As Apollo missions progressed, Apollo 12, 14, 15, 16, 17 had lunar landings using their LMs. Apollo 13 had a terribly dangerous accident when an oxygen tank exploded. The Apollo 13 Lunar module, called Aquarius, played an unexpected role in saving the lives of the three astronauts after the explosion. The LM was consisted of an ascent stage and decent stage. This was the unmanned lower part of the LM. it looked like octagonal-shaped and Made of aluminum compound metal with four legs for landing contained the batteries and oxygen tank and scientific equipment to be used for the descent to the moon and astronauts’ stay on the moon. This was the roundish upper half of the LM, the command center and crew cabin as well as the launching rocket for leaving the moon. On Monday, January 22, 1968, a 16-ton unmanned Lunar Module surrounded by a protective shield stood on top of a two-stage Saturn 1-B rocket called Apollo 5. This flight was made to do two important tests. One was to check separating stage from main rocket. The second was to check test firing of the descent engine, but this mission did not succeed. The Apollo 5 test ended after eight hours, and the LM remained in earth orbit. It eventually dropped into the atmosphere and burned up. This page was last changed on 9 April 2019, at 12:24.